Since the guys at tupalo.com seem to have changed their search URL/syntax, I had to update the mycroft/opensearch plugin for Firefox accordingly. 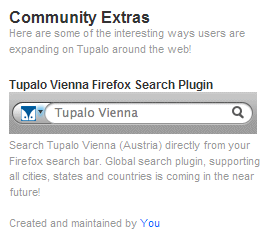 The plugin is still limited to Vienna, because the search URL/syntax at tupalo.com is... once they change that, I'll follow suit. Btw: the Tupalo Tools & Widgets page links to the search plugin, too.